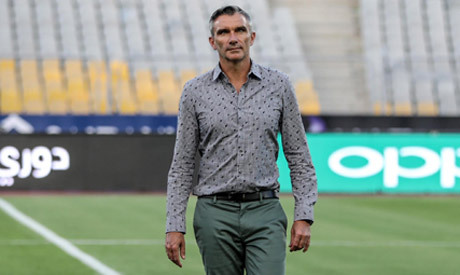 Ahly's coach Patrice Carteron blamed bad luck and heavy scheduling for his side's goalless draw on Monday in Alexandria in their kick-off game against Lebanon's Nejmahin the first leg of the round of 32 in the Arab Club Champions Cup, adding that Ahly would win in the return match in Lebanon. "I am not satisfied with the players' performance, but I am confident we will win the second leg. We dominated the game, but we couldn't capitalize on the 15 chances we had. Just one chance would have been enough," the newly-appointed French coach stated in the post-match press conference." "We are building a powerful team capable of translating all chances into goals, but this takes a lot of time and effort," Carteron said. The all-time Egyptian champions dominated as expected, but could not score a winner despite pinning Nejmah into their own half for the entire game and being profligate, especially in the first half. "We play every three days, so we have to provide all players opportunities to play and I won't talk about the missing players. The players we played did their best, but they weren't lucky," he added. Cateron made some major changes in Monday's starting line-up by resting some of Ahly's key players, including Moroccan striker Walid Azaro, Tunisian fullback Ali Maaloul, and Malian defender Salif Coulibaly. Cateron also fielded veteran keeper Sheriff Ekramy instead of starter Mohamed El-Shenawi, while Mohamed Hani played as a right-back instead of the veteran Ahmed Fathi, who was deployed as a central midfielder. Ahly will be hosted by their Lebanese counterparts in the second leg on 27 September. They will need to win away from home to advance to the last 16. The Egyptian Premier League winners reached the semi-final of the Arab tournament last year but suffered a surprise exit at the hands of Jordan's Al-Faisaly, who lost to Tunisian giants Esperance in the finals.